2004 College Championship quarterfinal game 2. Christopher Lee, later of "Lord of the Rings", sucked blood in 1968's he "Has Risen from the Grave"
In Italian it's known as "La Torre Pendente"
This 2004 Fox show featured the line "I'm going to Waikiki to get a bikini wax... want to meet me after your shift's over?" The name of this unit of currency used in Libya is from the Latin for "ten"
A song from "Dirty Dancing" says, "Now I've had" this; "Yes, I swear it's the truth and I owe it all to you"
(Hi, I'm Anderson Cooper of CNN.) 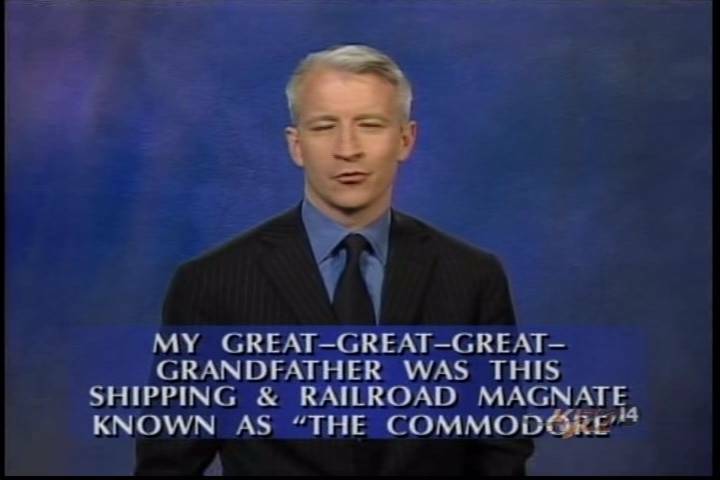 My great-great-great grandfather was this shipping & railroad magnate known as "The Commodore"
On Feb. 11, 1993 this Florida prosecutor was nominated Attorney General of the U.S.
"The Diary of" this songstress included "Diary", a haunting duet with Tony! Toni! Tone!